What would knowing you had someone ready to solve critical system problems do for your peace of mind? An international company headquartered in Germany intended to support the US branch office from headquarters, leaving the US team without real-time support after 11 am every day. "...the IT guys from Germany were extremely happy...out of 10 [branches] not once did they have the IT support you provided....they had said they would never give up control to an employee, let alone an 'outsider'... knowing you're here is huge for me and our productivity here." Like having a top-flight IT department without the overhead and training worries. Specialists on the Genesis Team proactively monitor and manage your servers, your workstations, network security, data backup and more, depending on the program you choose. Now you can have all the IT power you want without the need for advanced technicians on staff. Oversight for your network; servers; workstations. 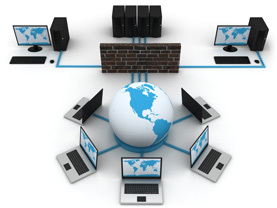 Oversight for your network; servers and;workstations. Genesis proactively monitors your key business resources such as the firewall, network, servers, and applications from our state-of-the-art network operations center. This keeps your systems functioning optimally and efficiently.